The 2003 Bob Davids Award is presented to Fred Ivor-Campbell. Fred's first baseball research led to brief biographies of Pete Reiser and Larry Doby for a junior high school English class. In 1981, Fred joined SABR after being encouraged to do so by Cliff Kachline. Fred's first SABR publication came in 1985 when he contributed an article to The National Pastime. Fred has written for many SABR publications and also for Total Baseball and the Biographical Dictionary of American Sports. Fred recently served as Vice President of SABR, from 1998 through 2002. During this time, he did much to coordinate and energize regional chapters of the organization. Previously, he had been a Director from 1992 through 1996 and was always regarded as a calming voice on the board. Fred has also served as the chair of SABR's 19th Century Committee from 1991 through 1998. Currently, he is an editor for BioProject, a committee that is writing biographies of everyone who has played or managed in the majors. He wrote the guidelines for authors for this project. Fred also edited Baseball's First Stars, which earned a Sporting News-SABR Award for 1996. He has served twice on the Seymour Medal award committee and was instrumental in developing the guidelines for the award. He has been busy but that's not the entire list of Fred's contributions to SABR. There is someone by his side at each SABR meeting, his wife, Alma. She has been coming to meetings for many years and joined SABR in 1993 when the family rate was instituted. It is an honor and pleasure to present this award to Fred Ivor-Campbell. 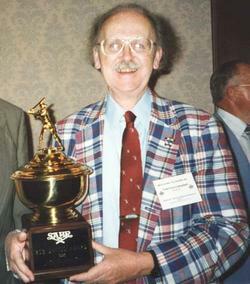 Related link: Fred Ivor-Campbell was the recipient of a SABR Salute in 1999.